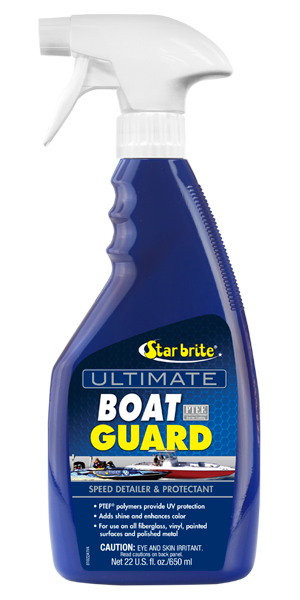 Boat Guard Speed Detailer & Protectant uses high-tech polymers that bond to fiberglass, polished metal, plastics, rubber and painted surfaces to add shine, enhance color and provide a barrier to UV damage. Just spray on and buff off to keep the boat looking its best and extend the time between having the boat waxed or polished. For use on Fiberglass, Vinyl, Painted Surfaces, Polished Metal & Rubrails. Gently removes dirt and grime. Spray onto on surface to be treated and use a clean, soft cloth to apply in a circular motions, working in areas approximately 18" by 18" in size. Allow Boat Guard to dry to a haze before lightly buffing area with another clean, soft cloth. Use as often as needed. For maximum protection of fiberglass, polished metal and painted surfaces, apply Star brite® Premium Marine Polish with PTEF® annually. Avoid overspray onto fabric or to glass; wipe off or rinse off any overspray immediately to avoid stains or streaks.